Elizabeth Schiller, 16, of College Station, has a new trophy hanging on the wall in her bedroom among her track medals, except it isn’t gold, silver, or bronze. Rather, it’s a plastic breathing tube that serves as a testament to the strength and endurance that helped her survive. For Elizabeth, running is life. The teenager began her track career in sixth grade and is a dedicated member of the cross country team at A&M Consolidated High School in College Station, cheerfully waking up at six in the morning every day for practice. But never did she think her passion for running would actually play a role in saving her life. In late February, Elizabeth came down with the flu, and should have felt better after a few days. Instead, she felt worse. “It felt like there was fire in my chest,” Elizabeth says. Parents Kevin and Lindsey Schiller took Elizabeth to the emergency room at Baylor Scott & White Medical Center – College Station where doctors sent her by helicopter to McLane Children’s in Temple. Even though Elizabeth had an annual flu vaccine, her body’s reaction to the flu virus left her more susceptible to bacteria. She developed bacterial pneumonia and contracted Methicillin-resistant Staphylococcus aureus, or MRSA, an antibiotic-resistant staph infection. She also had sepsis, a life-threatening complication triggered by an extreme response to infection. Unable to breathe on her own, Elizabeth had to be intubated and put on breathing machines. Elizabeth’s team of caregivers at McLane Children’s recommended putting her into a medically-induced coma to minimize stress and help her body recover. “They told us it would get worse before it got better, but we didn’t know how much worse,” Mrs. Schiller says. Elizabeth was in a coma for 40 days. 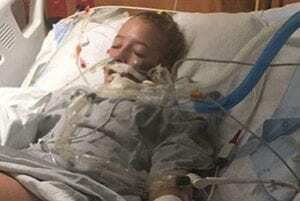 She had five chest tubes, two on her right and three on her left, to drain the fluid around her lungs, and underwent two surgeries to help clear the infection from her lungs. Friends who visited Elizabeth in the hospital decided to hold a 5K to help raise funds to cover her medical costs. Some worried, however, that the race would turn out to be a memorial run. Thankfully, Elizabeth’s “runner’s lungs” responded quickly. With the strength and endurance acquired from long-distance running, Elizabeth’s lungs recovered faster than many other patients’ would have. Doctors say her general fitness likely also played a role in keeping her alive when her condition first began to decline. “If I was a couch potato, I probably wouldn’t be where I am now,” she says. When she woke, Elizabeth couldn’t walk or talk, but was soon itching to run again. She began physical therapy with simple exercises to help rebuild her strength after being in bed for so long. However, she surprised the staff at McLane Children’s by jogging about ten feet through the hallway. After 56 days in the hospital, Elizabeth is now back at home and is working toward running again with trips up and down the stairs in her home and the occasional short run. She even ran a short distance in the 5K held in her honor in May. Her ultimate goal is to run competitive cross country in college.